Zimbabwe's opposition Movement for Democratic Change says it is suspending its leader Morgan Tsvangirai, amid deepening divisions in its ranks. A statement issued by the party after a meeting in Harare accused him of a "remarkable failure of leadership". It also said he had deviated from the party's democratic founding principles. Mr Tsvangirai lost a third election challenge to veteran President Robert Mugabe in 2013 and defied calls to stand down after this defeat. A BBC reporter in Zimbabwe says the MDC appears to be heading for a split that will only strengthen Mr Mugabe's hold on power. Several other senior party figures were also reported to have been suspended at Saturday's meeting, and some suspended members to have been reinstated. The MDC statement said the party had been "transformed into a fiefdom of the leader" under Mr Tsvangirai. It also accused him of sponsoring a culture of violence against MDC members not aligned with him. MDC Secretary General Tendai Biti, who spoke to journalists after the meeting, said Mr Tsvangirai and some other senior officials had "betrayed" the MDC's struggle, AFP reported. But an MDC spokesperson, Douglas Mwonzora, maintained that Mr Tsvangirai remained the MDC's legitimate leader. "This was not a national council meeting," he told AFP. 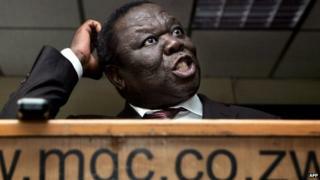 David Coltart, a founding member of the MDC, told the BBC that Mr Tsvangirai's suspension - although not unexpected - was a bad thing for democracy in Zimbabwe. "I'm not surprised this has happened because tensions have been brewing for quite a long time. "But I am concerned about this. What we need in the opposition is consolidation, not further splitting. "Morgan Tsvangirai, for whatever can be levelled against him, remains a very popular figure and we really do need him as part of the overall democratic forces," Mr Coltart said. From 2009-2013 Mr Tsvangirai served as prime minister in a fragile power-sharing government, with Mr Mugabe remaining Zimbabwe's president. Mr Mugabe's party won a huge majority in the vote, which Mr Tsvangirai dismissed as fraudulent. His defeat was a major setback for a man who for many years posed the only credible challenge to President Mugabe.